Post-secondary education is a strong element in the HIRE Education Employment Model. Sometimes a second chance is all you need to succeed; Phil is living proof of this. After dropping out of high school at age 17, the pressure of working full-time to help support his family was overwhelming and he was not making the wage he needed to. U.S. Census data tells us 9.4% or 31,000 adults in Dane County over the age of 17 do not have a high school diploma. Recently, United Way has begun creation of the HIRE Education Employment model that will help non-high school graduates navigate their way through the various systems needed to get the job they desire. This model will target individuals ages 17+ who do not have a high school diploma seeking to find employment. Individuals who enter the HIRE Education Employment initiative will start their journey by meeting with a Mentor who will assess where on the ladder they should start. if an individual hasn’t received their high school diploma they will get connected with GED prep classes and complete their degree. 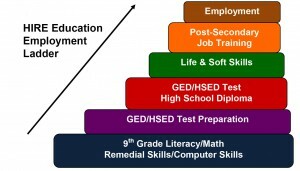 After they have attained their GED they will receive training on soft skills needed to succeed in an employment environment (how to communicate with your coworkers, dress for work, interview, put together a resume, etc…). Jones says United Way and their partners have high hopes for how this will connect individuals to attaining long term success.